The VT510 is a low-cost, single-session, text video terminal featuring enhanced keyboard and communications flexibility. All three versions have a 25-pin stacked male/female RS-232 connector (EIA-232), a 6-pin EIA-423 (MMJ) connector, and a Centronics parallel connector. These ports connect to a host or a printer. The VT510 offers a choice of two keyboard layouts—a VT keyboard layout (LK450) or an enhanced PC keyboard layout (PCXAL). The VT keyboard (Figure 1–1) and the PC keyboard (Figure 1–2) differ in the placement of some of the keys, like the arrow keys. 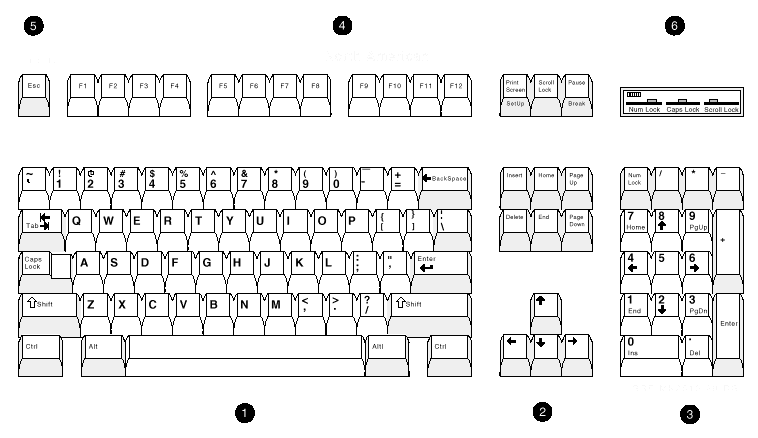 A VT keyboard has 20 function keys, F1 through F20, above the main keypad, while a PC keyboard has 12 function keys, F1 through F12. 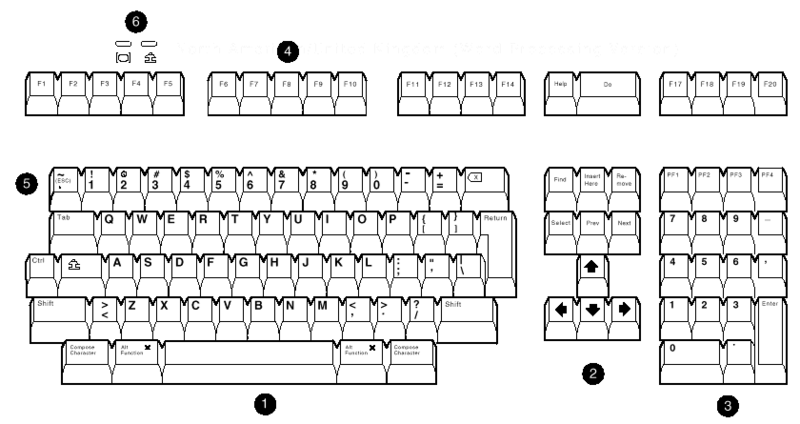 (4) Function keys, (5) Escape key, (6) Indicator lights. An IBM PS/2 6-pin mini DIN connector. Keyboard keys that can be reprogrammed to send single characters, to send character sequences, or to invoke local functions (Hold, Copy and Paste, Remove, Insert, Print Page, Toggle Autoprint, Set-Up, Break, and so on). A local user-defined key editor. Key definitions can be saved in nonvolatile memory. Eight levels of user-defined function keys: Unshifted, Shifted, Control, Shift Control, Alt, Alt/Shift, Alt/Control and Alt/Shift/Control. 804 bytes of nonvolatile memory available for custom user-defined keys (UDKs). The maximum length for a UDK definition is 255 bytes. A Centronics parallel printer port. Bidirectional serial communication ports (male and female). Baud rates from 300 to 115.2K baud. Null characters that can pass as data to the printer port. The terminal has both ANSI and ASCII display and text processing capabilities. The features of each are listed below. The terminal provides an enhanced menu-based Set-Up, allowing common features to be accessed easily from a single screen. All Set-Up features are host controllable to allow remote configuration. The terminal also has a means to lock out the local setup. Set-Up menus are available in English, French, German, Italian, or Spanish. For details, see Chapter 2, Terminal Set-Up. For details, see Chapter 3, Desktop Features. In addition to the traditional Digital graphic character sets (DEC Multinational, NRCS, and so on), the VT510 supports Cyrillic, Greek, Hebrew, Turkish, most Eastern European languages, and PC character sets. For details, see Chapter 7, Character Sets. All VT510 models include support for a 4 Mbit (512 KByte) ROM cartridge option. The base unit comes with a factory-installed ROM. The ROM cartridge connector is protected by a ROM cartridge cover. To install new code, the ROM cartridge cover is removed, and a ROM cartridge with attached cover is plugged into the ROM connector. The new code completely supersedes the factory-installed ROM code. It does not overlay or extend the factory code. If you service the terminal with a ROM cartridge installed, remove and save the ROM cartridge to put it on the new terminal. PCTerm mode is designed to allow the terminal to emulate the console of an industry-standard PC. A separate character set selection is used for PCTerm mode. This selection is controlled by the PCTerm character set selection in Set-Up and the DECPCTERM control function. Changing this selection does not affect the VT character set selection. The Primary Device Attributes can report additional extensions to cover new features. See Chapter 4 for a summary of the control functions. The Secondary Device Attributes are different. Where Pv is the firmware version number. The VT510 has four buffers, which can load up to two dynamically redefinable character sets, each with an 80-column font and a 132-column font. DEC LK401 and compatible keyboards cannot be used on the VT510; however, the VT510 can emulate other keyboards when configured accordingly. The VT510 is a single-session terminal. PC character sets are available in SCO Console mode, and they do not require the keyboard to send scancodes, as PCTerm mode does.